With Sam Raimi's 3D spectacular Oz The Great & Powerful due out in cinemas imminently, the BFI is currently running a retrospective of films based around L. Frank Baum's well loved series of children's books, Returning To Oz. Naturally, any discussion of the subject has to begin with the Judy Garland version, which is so iconic and enduring that stills and clips from it are frequently used today to encapsulate the very idea of Hollywood studio filmmaking (among other things). However, the MGM musical was by no means the first attempt to bring Baum's work to the silver screen, the author himself having founded the Oz Film Manufacturing Company in 1914 for the express purpose of adapting his stories for what was then a novel new medium. However, the company only issued three features before folding after just a year: The Patchwork Girl Of Oz, The Magic Cloak Of Oz and His Majesty, The Scarecrow Of Oz. Tonight I saw the first of these as part of a double bill with an even earlier effort, a 13 minute short of The Wonderful Wizard Of Oz produced by the Selig Polyscope Company in 1910. This latter project came about after producer William Selig acquired the rights to Baum's original and still best-remembered Oz tale after helping to bankroll the author's disastrous 1908 theatrical folly, The Fairylogue & Radio-Plays, a touring multimedia stage show that dramatized the writer's work by combining a lecture and slide show with film and live performances, a hit with audiences but a financial debacle. 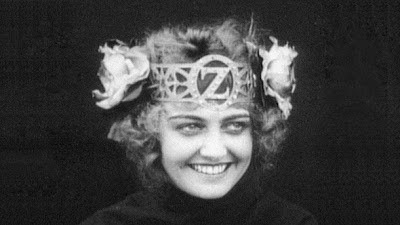 The Patchwork Girl Of Oz, directed by J. Farrell MacDonald (who was subsequently blamed for its failings and fired), has much more time at its disposal but makes a good deal less sense. Baum's script introduces us to Munchkin boy Ojo (confusingly, he's played by Violet MacMillan, a girl) who lives with Unc Nunkie (Frank Moore), his impoverished uncle. The pair are starving because their bread tree won't blossom, so they head off to the Emerald City, stopping off at the home of magician Dr Pipt (Raymond Russell) on the way, wherein the Patchwork Girl is brought to life and Unc Nunkie and others are accidentally petrified into marble, prompting Ojo to set out on a quest to gather the ingredients for an antidote, running into a Woozy (a large cardboard cat), a green bearded city guard, a lonesome beast named Zoop, savage Tottenhots and a townful of malicious Hoppers, who sever a leg from anyone with the audacity to walk around with two. In another case of oddball gender bending, Scraps, the titular servant girl, is played by a man, French acrobat Pierre Couderic, who flops and tumbles like a rag doll magnificently but is also utterly terrifying, worse even than the Scarecrow. Despite this, and the narrative suffering as a result of lost footage, The Patchwork Girl Of Oz manages to sprinkle the Powder of Life onto some inventive characters and must have appeared a marvel in its day. It also contains one other particular point of interest for film historians. Just as Oliver Hardy would appear in an early role as the Tin Man in Larry Semon's 1925 version of The Wizard Of Oz, so another silent great, Harold Lloyd, appears here. Admittedly, he's hard to recognise beneath his Cowardly Lion costume but apparently that is indeed him.